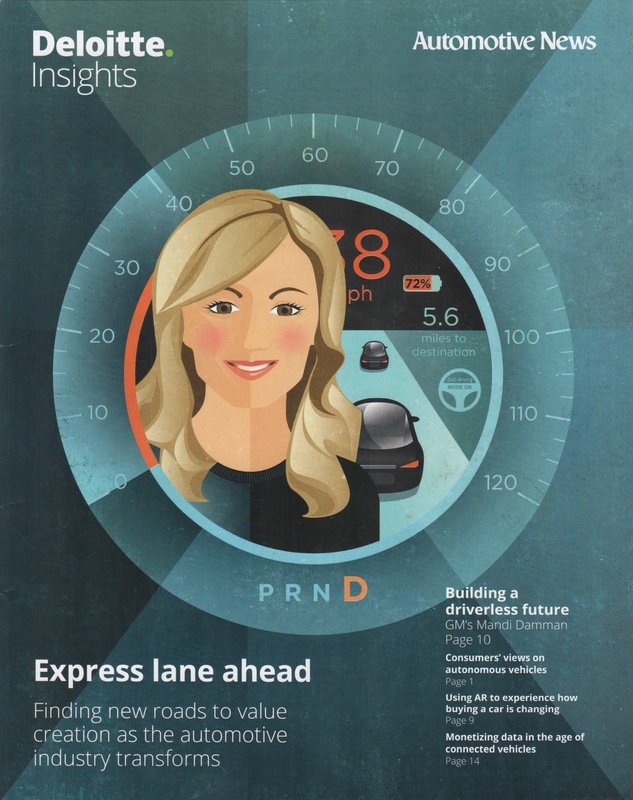 DELOITTE INSIGHTS: Express Lane Ahead was recently published as an informative 25-page spiff to Automotive News, my weekly source of auto industry matters. This, an image following, and information are from Deloitte Insights: Express Lane Ahead. Here in Parts 1 and 2, today and tomorrow, are tidbits gleaned from “Tempering the Utopian Vision of the Mobility Revolution,” by Craig A. Giffi, Joseph Vitale Jr., and Ryan Robinson, one of the Deloitte articles. I also include related insights from Automotive News. Deloitte Touche Tohmatsu is one of the “Big Four” global specialists in accounting and professional services. (The other three, if you like to keep track of such things, are Ernst & Young, KPMG, and PricewaterhouseCoopers.) Here, the Deloitte authors discuss four key trends: vehicle electrification, vehicle autonomy (AV), vehicle connectivity, and shared transportation. They begin with a key question. Are EVs the Trick? Deloitte data show various degrees of interest in the electrification of personal mobility around the world. Image from Express Lane Ahead. 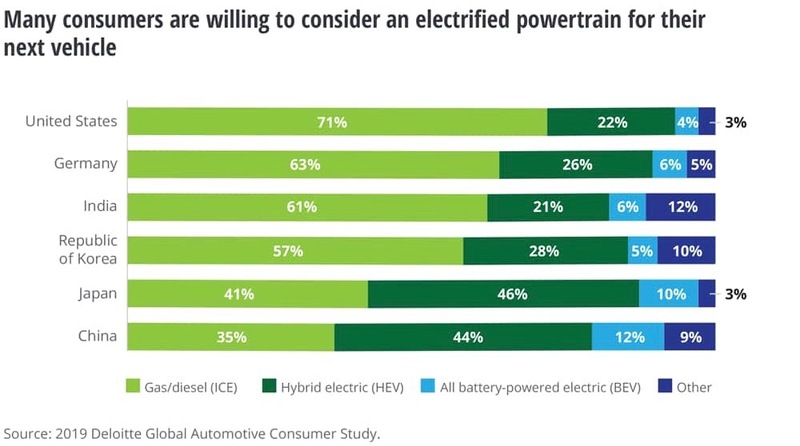 Deloitte global data also show electrification trends favoring hybrids, not battery electrics. Others, such as fuel-cell electrics, show global awareness as well; indeed, in India and Korea, they outscore BEVs. Addenda: Automotive News, January 28, 2019, offered insight by Yang Jian in “Now We Know Who is Really Buying Electric Vehicles in China.” Briefly, the China Association of Automobile Manufacturers reported that roughly 886,000 EVs and plug-in hybrids were sold January–November 2018. However, 201,000 of these, fully 23 percent, went directly into the manufacturers’ fleet divisions. It’s a far cry indeed from government subsidies in favor of vehicle electrification. Another issue is creating the infrastructure to support all-electric vehicles. The electrical grid is aging and strained as it is from generating electricity to delivering it. Electric and autonomous vehicles are something I have been interested in forever as an electrical engineer, systems designer and developer, and avowed autophile (the car type, thank you). Electric vehicle adoption will be held back by slow fueling, lack of infrastructure and high initial cost. Maintenance is low compared to an ICE car, but only for BEVs. Until there is a critical mass of used BEVs, low maintenance costs will have minimal impact on the market (IMHO). Lack of infrastructure includes both filling stations and home charging since a large majority of the driving public does not own a parking space where a personal charger can be mounted (at additional cost). So into the near future, I see Hybrids being the preferred EV type, with a minority of people like me who want and have the infrastructure for a BEV. Thanks, J.L., for these comments (and, by the way, for your enthusiasm for this website). I am gratified that your views agree with my own assessments in many ways. As one example, being a low-mileage, short-trip, tech-enthusiast driver, I could be a prototypical BEV user. However, living in a 1960s era home, I would have to make considerable investment for safe home charging. A similar quandary exists for me in exploiting home solar power. That is, I’m not exactly a Luddite, but …. This entry was posted on February 17, 2019 by simanaitissays in Driving it Today, Driving it Tomorrow and tagged "Automotive News" insert: "Express Lane Ahead" "Deloitte Insights", "Now We Know Who is Really Buying Electric Vehicles in China" the makers themselves "Automotive News", "Tempering the Utopian Vision of the Mobility Revolution" "Deloitte Insights", "Who Covers the Other Costs?" 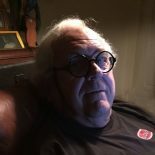 Keith Crain on infrastructure "Automotive News", Deloitte Touche Tohmatsu, global EV count still a drop in the bucket, The Big Four accounting/professional services: Deloitte Touche Tohmatsu/Ernst & Young/KPMG/PricewaterhouseCoopers.